Alex J. Rivera, 86, of Fort Dodge passed away Thursday February 15, 2018 at the Paula J. Baber Hospice Home. Funeral services will be at 10:00 AM on Tues­day, February 20, 2018 in the chapel of Laufersweiler-Sievers and 10:30 AM at Sacred Heart Church with Msgr. Kevin McCoy officiating the Mass of Christian Burial. Burial will follow at Corpus Christi Cemetery with Military Rites Conducted by the V.F.W. Post 1856 and the U.S. Army Honor Guard. A visitation will be on Monday from 4:00 to 7:00 PM with a Vigil Prayer Service at 4:00 PM all at Laufersweiler-Sievers Funeral Home. Alex is survived by his children, Robert (Kristine) Rivera of Fond du Lac, WI; Gail (Bruce) Rivera Crowley of Fort Dodge ; Juanita Rivera of Kapaau, HI; Maria (Donald) Nelson of Fort Dodge; David (Connie) Rivera of Omaha, NE; Christina (Robert) Russell of Fort Dodge; Angie Messerly of Fort Dodge; James “Sonny” (Mary) Rivera of Fort Dodge; 23 grandchildren; 25 great-grandchildren; and 2 great-great-grandchildren. He was preceded in death by his wife Delores; parents Pedro and Aurora; sister Juanita; daughter, Patricia; sons-in-laws, Roger Messerly and Steve Olson. Alex Joseph Rivera was born on February 18, 1931 in Bancroft, Iowa. His parents died when he was 3 years old and he was raised by his grandmother, aunts and uncles. 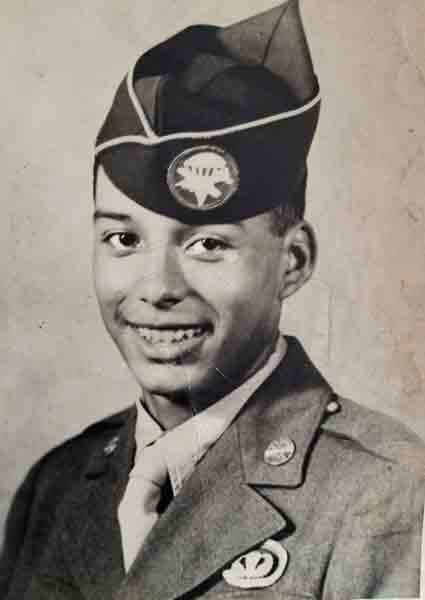 From 1947 to 1950, Alex served as a paratrooper in U.S. Army with the 11th Airborne Division, occupational force of Japan. In June of 1950, he married his childhood sweetheart, Delores Ayala at Corpus Christi Church. The couple established their home in Fort Dodge and they shared 64 years of marriage. Alex worked for 32 years at Hormel’s until retiring in 1982. He then went back to Iowa Central Community College, earned his Associates Degree. For several years, he worked for Lifeworks, Trinity Regional Medical Center, and Northwoods Living as a social worker and worked in counseling with Veterans suffering from P.T.S.D. Alex was a self-taught musician, enjoyed golfing and poetry, but his family was the most important thing in his life. Alex was a founding member of the Fort Dodge Mat Association which was instrumental in getting area youth involved in the sport of wrestling. He was a member of Holy Trinity Parish, served on the Chamber of Commerce, past president of the Fort Dodge Human Rights Commission, and past President of the Latin America Club. He was an advocate for immigrants coming to America helping them with learning English, to housing and hospital care. Alex was a true renaissance man.